Twelve long years ago, back in 2004, I remember reading a report from the CRA, (now CR) that polled the main frustrations dentists had with carbides. The two that were nearly tied for first were a lack of aggressive cutting and breakage. Then it dawned on me that every single carbide manufacturer, including us, was out there in the trade magazines bragging how fast their carbides cut. I saw the phrase “cuts like butter” misused more times than I can count. “Does butter really cut?” But, amazingly, nobody was talking about reducing breakage! We had just introduced the Neoburr and had almost no market share. But I remember thinking then, if we can just capture a very small share of the dentists that are sick and tired of breakage we could double or triple our market share. Let everyone else fight over saying which one cuts the fastest, we could focus on reducing breakage and it would be a huge winner for us. So we did. It wasn’t easy and it took 12 long years. The first thing we did was convert all of our shapes to a single piece construction. Welds and brazes are capable technologies, but if you are forced to rely on a weld to hold the head on you just introduce a variable that doesn’t need to be there. We did other things to make them stronger too. We relocated the position of the crosscuts on some of the burs and we maximized the grain structure of the actual carbide we purchased. People started to notice. I had dentists coming up to me at conventions saying, “You have the carbides that don’t break”. Still, I knew we could do better. The thought I couldn’t get out of my head was that the weakest place on the carbide was the neck. The neck is a thin place between the head and the shank where all the breakage takes place. Like everyone always says about carbides, the heads pop off. Well of course they do, and they do it at the weakest point, the neck. I asked myself why it even has a neck. I understood why our competitors had a neck. They needed a weld platform. But why us, we don’t have a weld. I immediately put together a hand-sketch of a bur without a neck and sent it to our manufacturing guys. Unfortunately they didn’t have the software or the machine capability back then to make burs without a neck. But we all agreed that as we moved forward with technology our goal was to remove or reduce this neck. Fast forward to 2015. We finally received the first prototype samples of burs without a defined neck. The first batch were 557’s. The next batch was the metal cutters. We almost couldn’t get them to break at all. It was crazy good. We had Emily, our product development engineer, develop a blind study with an outside testing company to see what they found. She sent them samples of our current carbide, our three biggest competitor’s carbides and our new no-neck carbide. They were marked in such a way that only she knew which ones were which. We sent them out to be break tested and held our breath to wait for the results. Amazing! 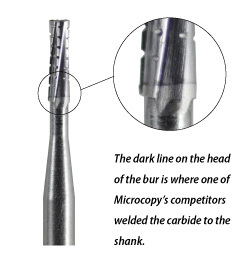 We get the results back and the burs are stronger than our old bur, over 20% stronger than one competitor, over 50% stronger than another and over 70% stronger than the third. Overall on average we are 50% stronger than the majority of the burs sold in the US. I am absolutely thrilled. This year, (2016), we introduced the NeoBurr 5572 . Our reduced-neck and square-crosscut design is so unique we have applied for a patent. It took a long time and a lot of effort but it’s the strongest carbide on the market by far. If you are tired of breaking carbides you owe it to yourself to make the switch.